A major obstacle in the path f the Persian King Xerxes' army was the Hellespont, a waterway at the head of the Aegean that was nearly a mile wide at its narrowest and separated Asia Minor from Europe. Xeres bridged the gap with ships, not in a ferrying operation but by constructing a unique pair of bridges with hundreds of vessels ranged side by side. The 120-foot-long ships were lashed together parallel to the banks of the Hellespont. "Having joined the vessels." wrote the Greek historian Herodotus, the bridgebuilders "moored them with anchors of unusual size." in order to resist the strong currents and the winds that blew through the Hellesport. The Persians then strung cables of papyrus and flax across the floating vessels from bank to bank, and windlasses on both beaches winched the cables taut. Next, Herodotus reports, planks "were laid side by side upon the tightened cables" and fastened in place. Xeres' engineers, in short, built a combination suspension and pontoon bridge. The cables took some of the weight and provided more consistent stability than the separate vessels, and the ships kept the lengthy, heavy cables from sagging into the water. Atop the planks of this combination bridge, soil was packed down to make an earthen roadway for the cavalry and troops. 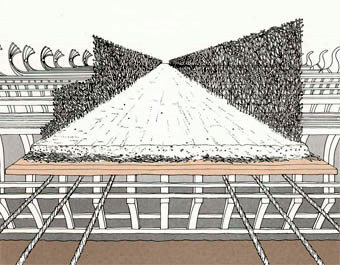 Walls made of matted branches (cut away in the drawing above to show the ships) were built to concern the Hellespont so that Xeres' horses would not panic. Xeres built two of these bridges, using 360 ships to cross a stretch a mile and a quarter wide and 314 vessels at a narrower crossing. So gigantic was his army that its horses trampled across the two highways for a week.